We were very pleased to find your Postcard in our letterbox this morning, it was a fantastic surprise! We could tell straight away that it was our house you had drawn on the front of the Postcard and we loved the amazing front door and how you coloured in each brick! There sadly has been no snow where we are, although it seems to have snowed everywhere else in England! We are University students who will only be living here together for one year so we feel extra special to have been chosen by you to be part of this project and would love to hear from you again! 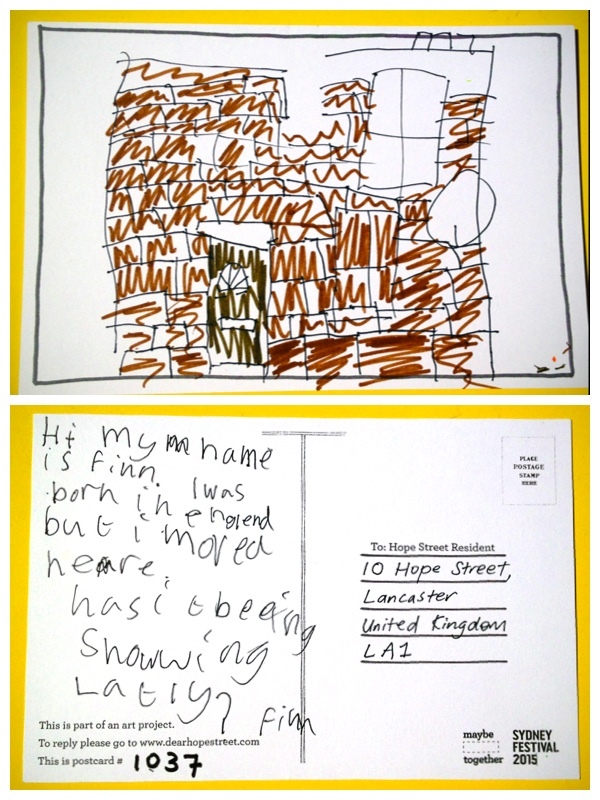 We were very pleased to find your lovely Postcard in our letter box this morning, it was a fantastic surprise! We could tell straight away that it was our house you had drawn on the front and we especially loved the amazing front door and how you coloured in each brick! Sadly, we did not get any snow this winter- just wind and rain, although it seems to have snowed everywhere else in England! We are 20 year old University Students and as we will only be living here together for one year we feel extra special to have been chosen by you to be part of this project and would love to hear from you again! Thanks so much for replying. It’s great to hear that you liked my postcard. I am 8 years old and have a younger sister called Maggie who is 5. I am on School holidays at the moment and it’s Easter too. Tomorrow we are going to the Blue Mountains to visit our friends and have an easter egg hunt! I cant wait! How many people live in your house? What are you studying? My favourite subject at school is Music and literacy. I like music because I am quite good at it and I like Literacy because I like making stories. My favourite books are Harry Potter (all 7) and the Game by Diana Wynne Jones. Have you read them? I am in year three at school. Today it was raining so we went to the movies to see Shaun the Sheep. Has it come out yet in England. Okay that’s about it now, I am going to bed after I have done my teeth. You guys must be 9 and 6 years old now! Sorry that we missed your last message, we’re so glad to hear that you like literacy because most of us are English students and we all love to read. In our last message we said we would only be in this house for 1 year… but in the we decided to stay for 1 more! This house has meant a lot to us because it has been our home for two years and your postcard made it extra special, so we wanted to say a big thank you!